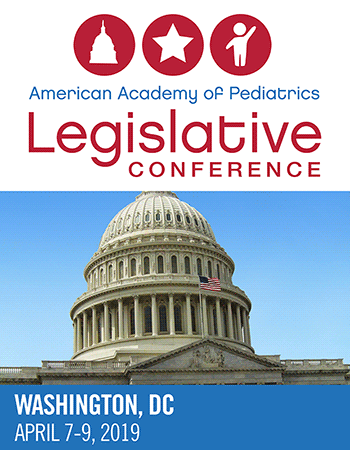 The American Academy of Pediatrics 2019 Legislative Conference will take place in Washington, DC April 7-9, 2019. During the conference, participants will learn how to become effective child health advocates through interactive workshops and in-depth training sessions, while networking with pediatricians, residents and medical students from across the country. Select specific advocacy skills-building workshops based on your interests, from coalition building to crafting your message. Experience the legislative process through hands-on work sessions. Visit with your members of Congress and their staff on Capitol Hill. Hear firsthand from distinguished guest speakers and policy experts about timely child health issues. Learn about policy priorities impacting children and pediatricians​. Network with other advocates and AAP leaders from across the country. Become a strong voice for children! The 2 ½ day conference begins at 7:30 a.m. on Sunday, April 7, with registration and breakfast. There is a full conference agenda on Sunday and Monday, April 8. Capitol Hill visits will take place on the morning of Tuesday, April 9, and the conference adjourns at 3 p.m. following a debrief session. Breakfast and lunch are provided each day of the conference: Sunday-Tuesday. Sunday: Introduction to advocacy, overview of key child health policy issues, guest speakers, and advocacy skills-building workshops (breakfast, lunch provided). Monday: Review of policy issue for Capitol Hill, guest speakers, and preparation for visits with congressional staff and members (breakfast, lunch provided). Tuesday: Capitol Hill visits, elected official speakers, and debrief (breakfast, lunch provided). The conference hotel rate is $289 per night. To make reservations, please visit the hotel booking website above to access the Capital Hilton Hotel’s American Academy of Pediatrics rooming block. The rooming block closes on March 15, 2019.